240-323 OS,2000 1 240-323, Part II CPU Scheduling Department of Computer Engineering, PSUWannarat Suntiamorntut. 2 240-323 OS,2000 2 Department of Computer Engineering, PSUWannarat Suntiamorntut Basic Concepts The basic problem is as follows: How can OS schedule the allocation of CPU cycles to processes in system, to achieve “good performance”? 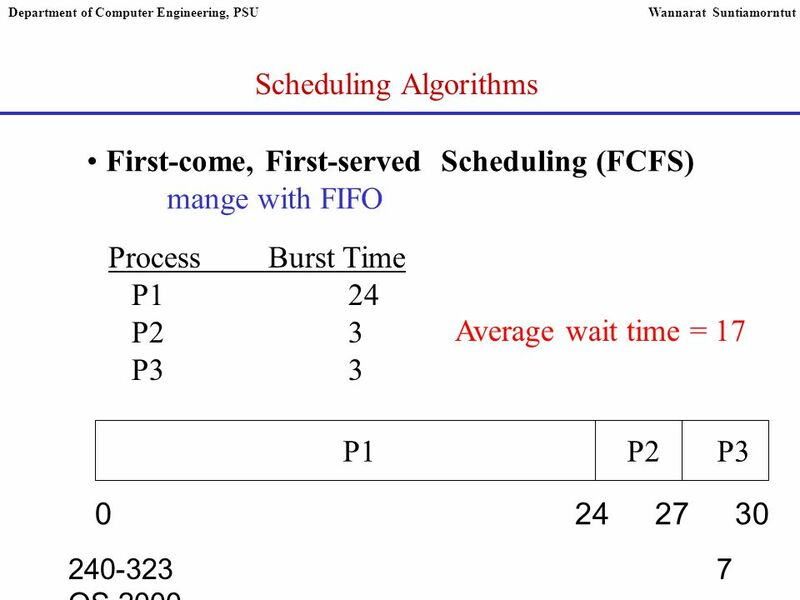 Scheduling is a fundamental OS function. 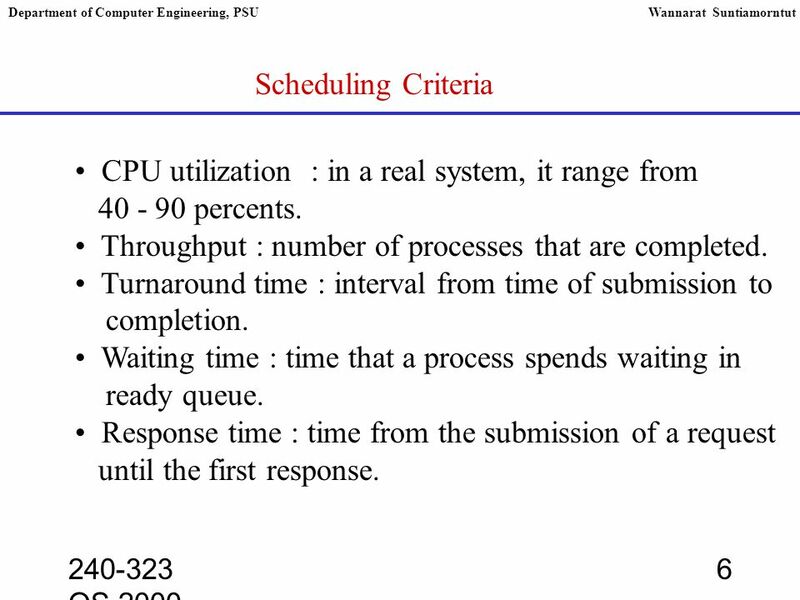 6 240-323 OS,2000 6 Department of Computer Engineering, PSUWannarat Suntiamorntut Scheduling Criteria CPU utilization : in a real system, it range from 40 - 90 percents. 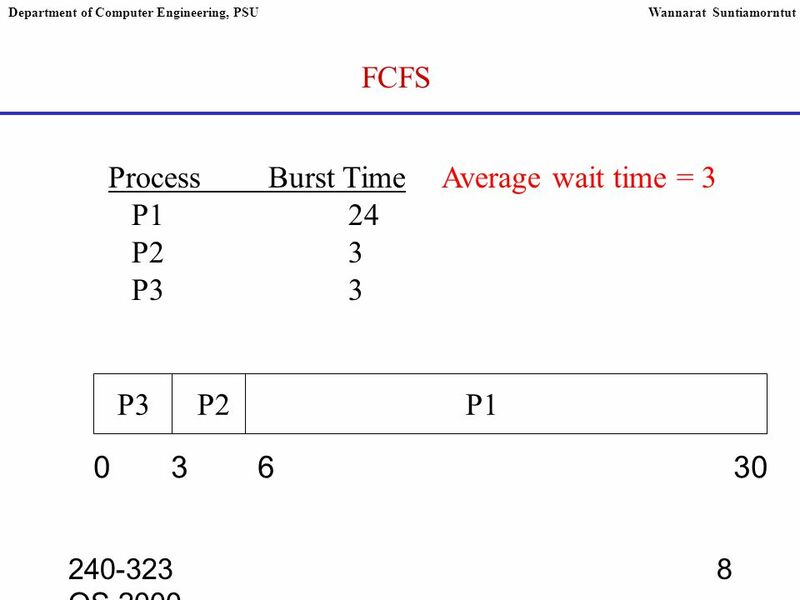 Throughput : number of processes that are completed. Turnaround time : interval from time of submission to completion. Waiting time : time that a process spends waiting in ready queue. Response time : time from the submission of a request until the first response. Download ppt "240-323 OS,2000 1 240-323, Part II CPU Scheduling Department of Computer Engineering, PSUWannarat Suntiamorntut." CH 5. 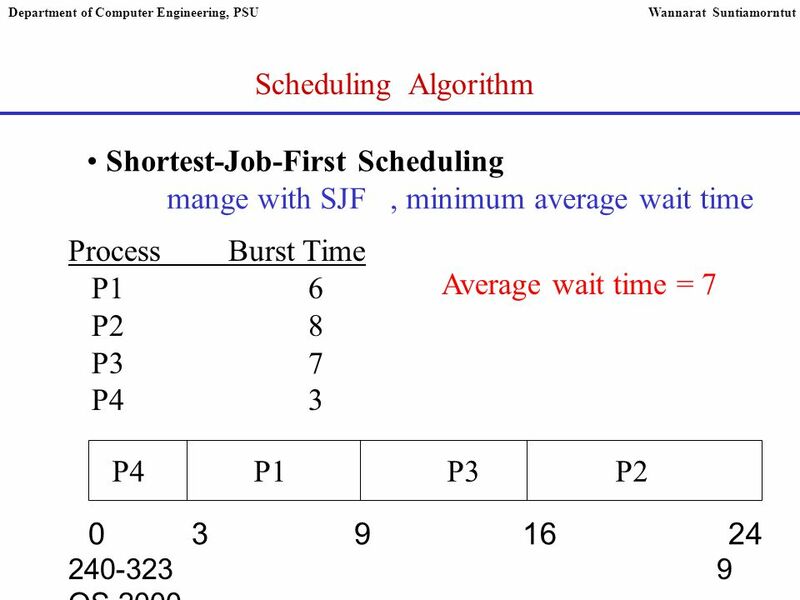 CPU Scheduling Basic Concepts F CPU Scheduling  context switching u CPU switching for another process u saving old PCB and loading. 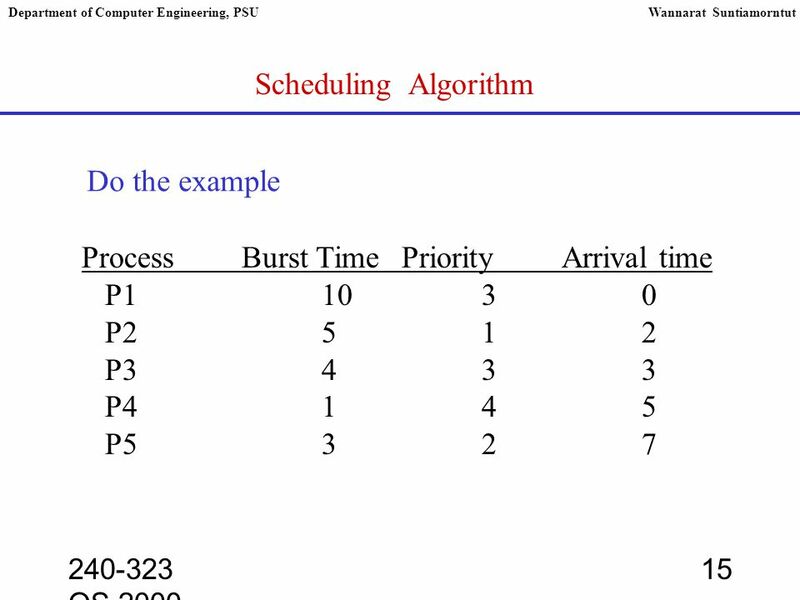 Silberschatz, Galvin and Gagne ©2013 Operating System Concepts Essentials – 2 nd Edition Chapter 6a: CPU Scheduling.  Basic Concepts  Scheduling Criteria  Scheduling Algorithms. 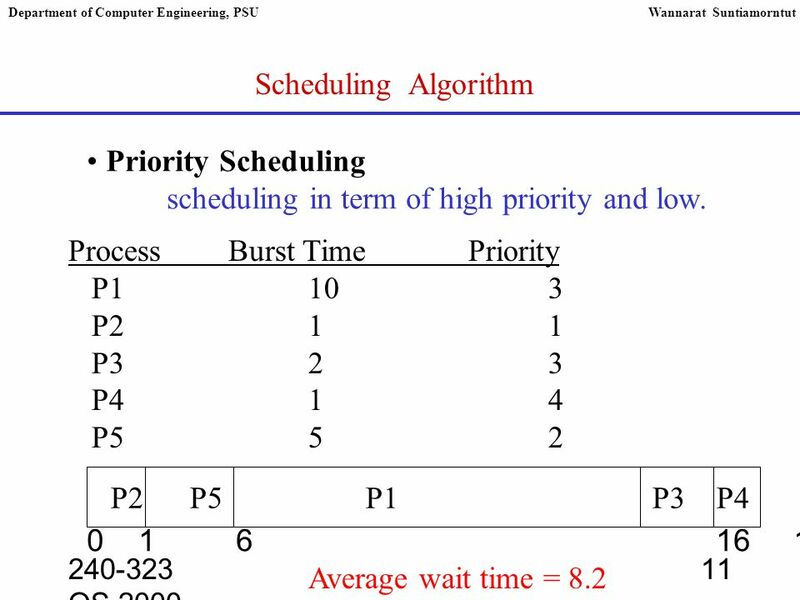 Silberschatz, Galvin and Gagne ©2009 Operating System Concepts – 8 th Edition Chapter 5: CPU Scheduling. Chap 5 Process Scheduling. 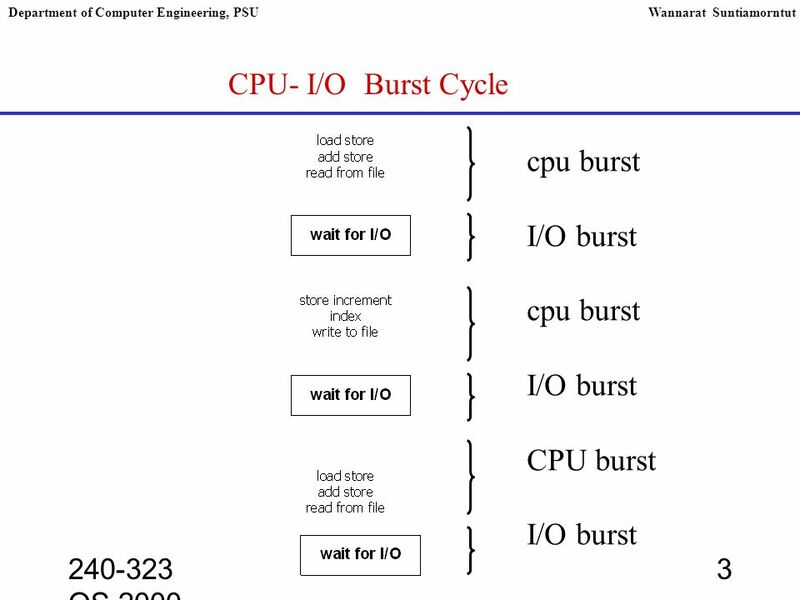 Basic Concepts Maximum CPU utilization obtained with multiprogramming CPU–I/O Burst Cycle – Process execution consists of a. Chapter 5 CPU Scheduling. 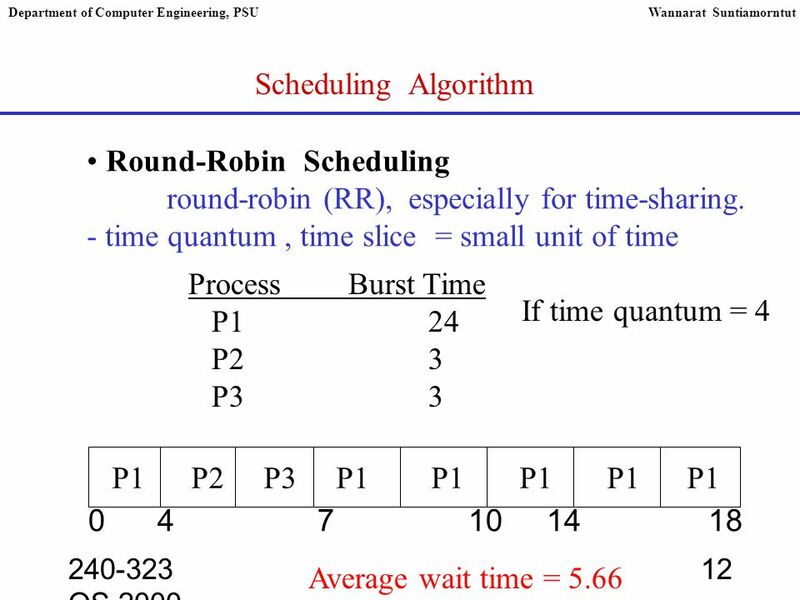 CPU Scheduling Topics: Basic Concepts Scheduling Criteria Scheduling Algorithms Multiple-Processor Scheduling Real-Time Scheduling. 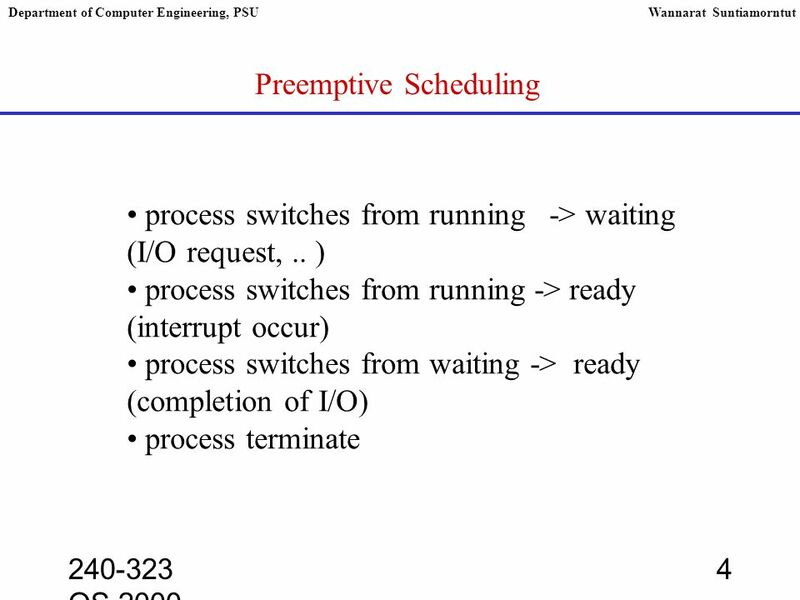 Operating Systems CPU Scheduling. Agenda for Today What is Scheduler and its types Short-term scheduler Dispatcher Reasons for invoking scheduler Optimization. 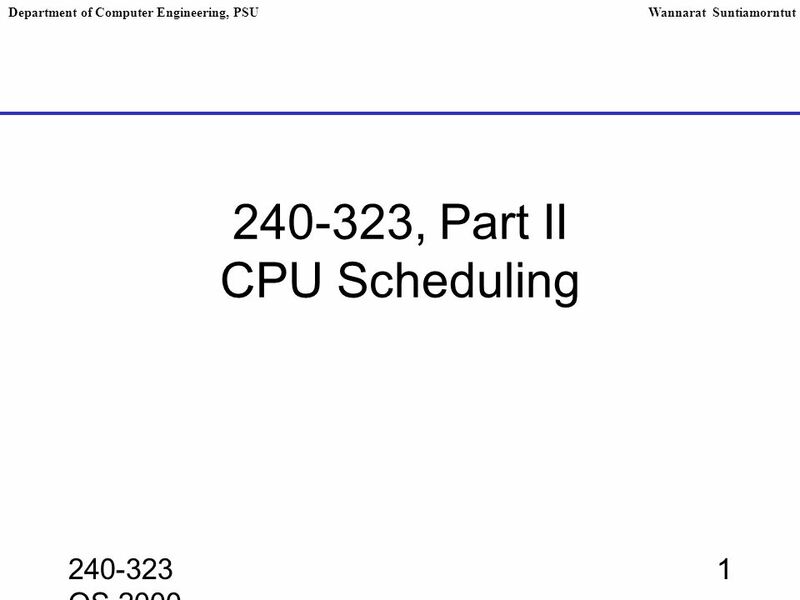 CPU Scheduling CS 3100 CPU Scheduling1. 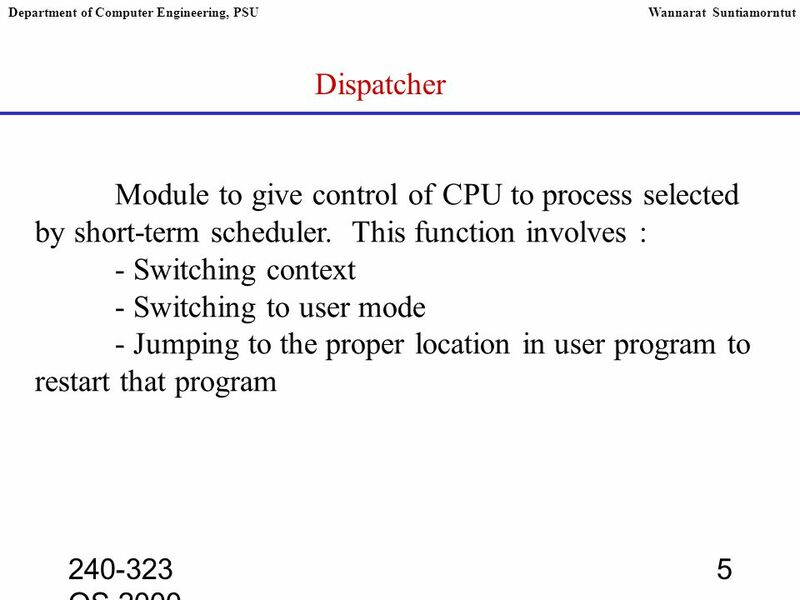 Objectives To introduce CPU scheduling, which is the basis for multiprogrammed operating systems To describe various. 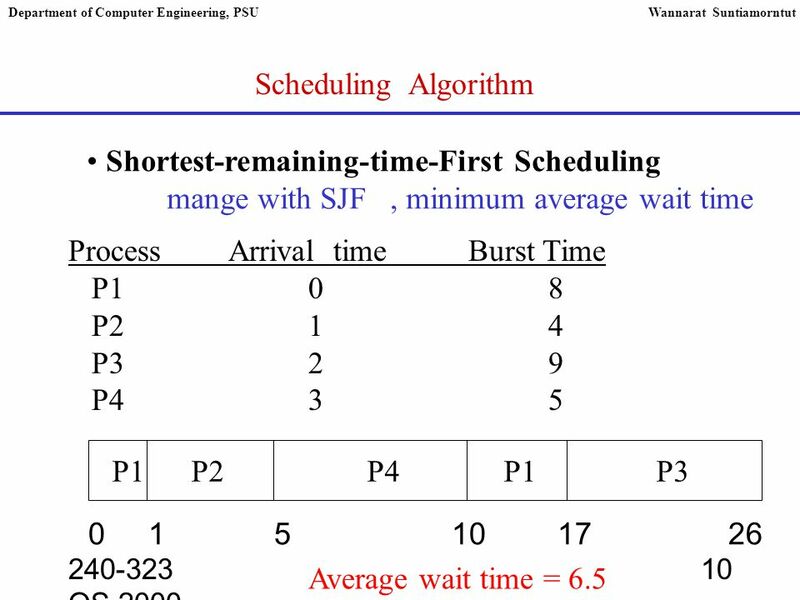 Silberschatz, Galvin and Gagne ©2009 Operating System Concepts – 8 th Edition, Chapter 5: CPU Scheduling. 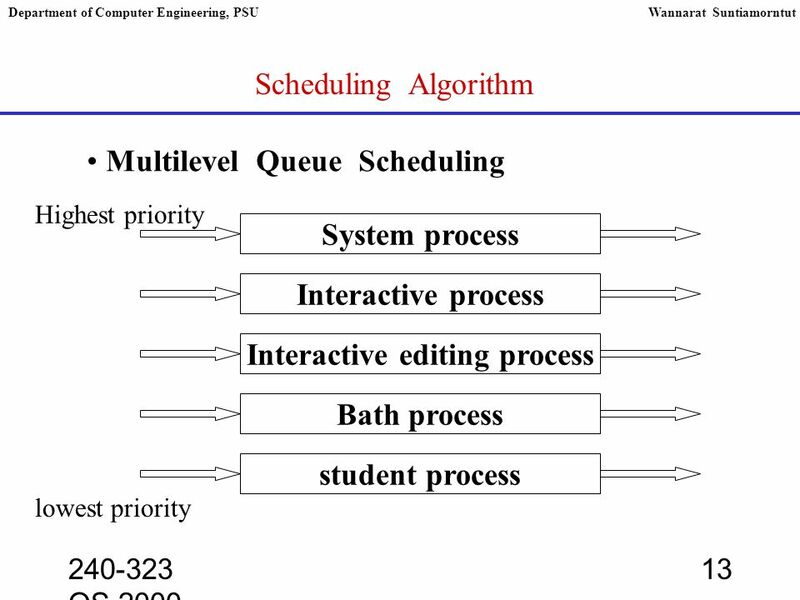 CS 311 – Lecture 23 Outline Kernel – Process subsystem Process scheduling Scheduling algorithms User mode and kernel mode Lecture 231CS Operating. 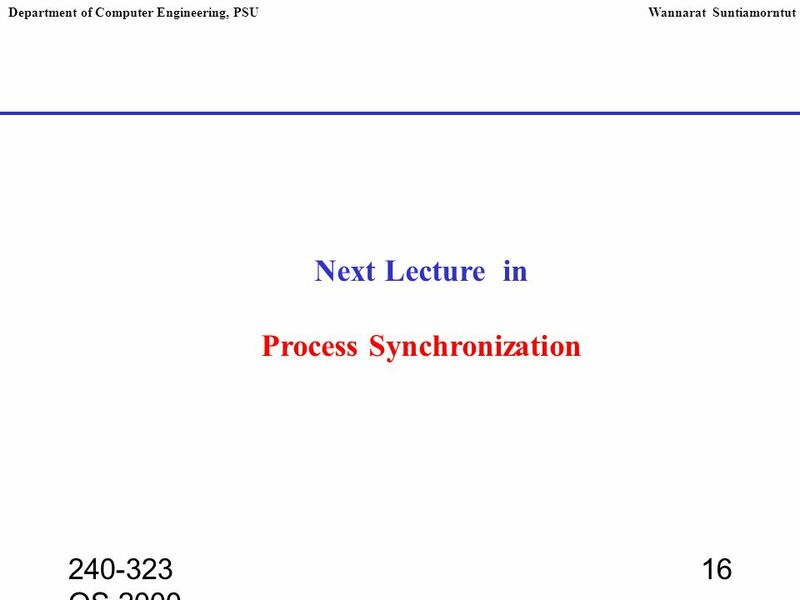 02/06/2008CSCI 315 Operating Systems Design1 CPU Scheduling Algorithms Notice: The slides for this lecture have been largely based on those accompanying. Chapter 6: CPU Scheduling. 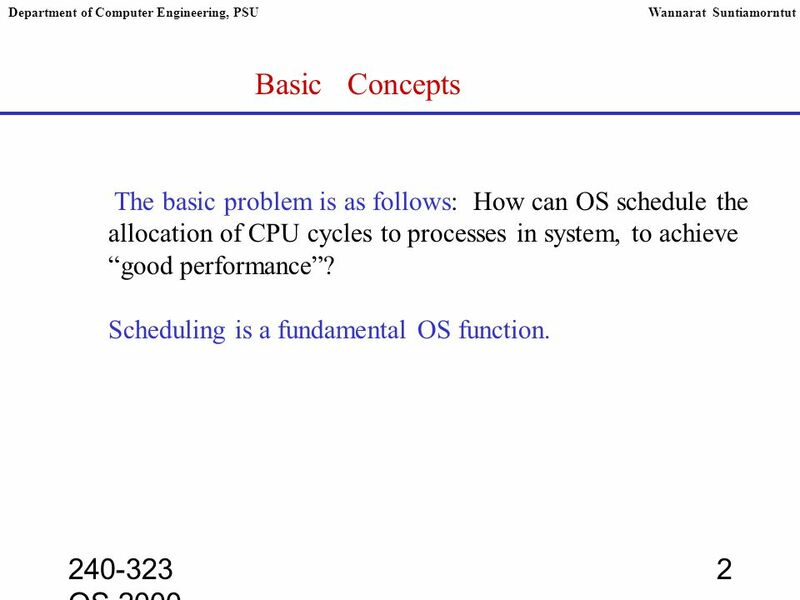 5.2 Silberschatz, Galvin and Gagne ©2005 Operating System Concepts – 7 th Edition, Feb 2, 2005 Chapter 6: CPU Scheduling Basic. 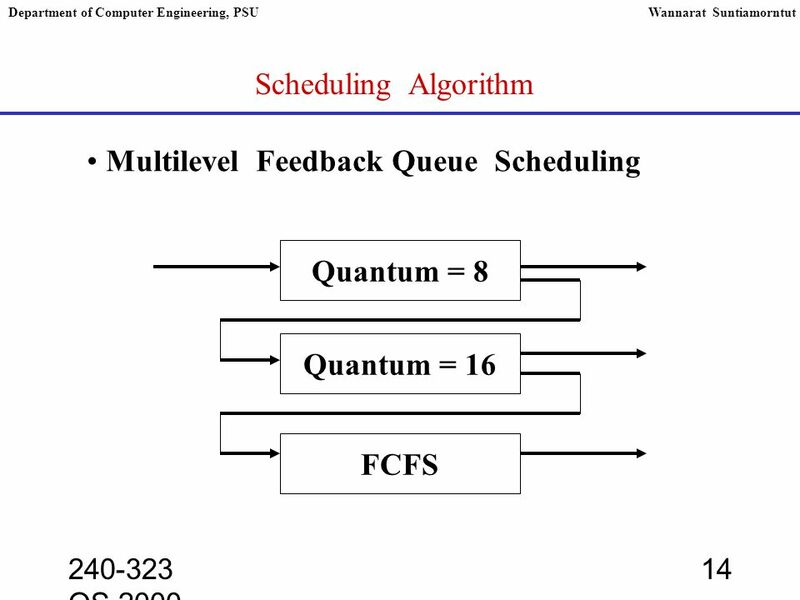 02/04/2008CSCI 315 Operating Systems Design1 CPU Scheduling Algorithms Notice: The slides for this lecture have been largely based on those accompanying.